Natural face masks hold a special place in our skin routines. Cleansing gets us going in the morning, serums give our skin that coveted glow, and facial oils keep us moisturized day in and day out. But masks allow us to kick back, relax, and let our skin soak in the goodness. Depending on the ingredients, they can draw out impurities, brighten your skin tone, or help diminish the appearance of wrinkles. Last year, we brought you 5 Anti-Aging Mask Recipes using mostly simple ingredients you probably already have in your kitchen. It's great when you can treat yourself to a luscious spa-like treatment using fresh ingredients and without even leaving your house! We wanted to kick it up a notch with one of our favorite ways to beautify: herbally. Herbs are nature's medicine, and each holds its own unique power. Your skin loves herbs, and masks give it a chance to receive more benefits (than if you just used an herbal face wash). Since not everyone has fennel or horsetail in their kitchen, each mask recipe we're about to share has one thing in common: our Ayurvedic Facial Scrub. Morrocan rhassoul clay is full of minerals that help nourish the skin, while naturally drawing out impurities, making pores look less visible. It also adds an exfoliating effect which helps reveal younger looking skin. Fenugreek seed is super effective against oily skin, exfoliates skin, cleanses, and conditions with natural oils and fats that hydrate skin. Lavender flowers not only impart a lovely scent, but reduce oily skin, and protect against environmental stressors. Rosemary tames excess oil, stimulates, tightens and firms, and helps protect. Lemon balm helps to reduce the appearance of occasional redness while natural antioxidants protect. It also has neem, horsetail, and comfrey, all packaged in a dry, powdered form to retain freshness. That means you can mix this formula with other natural ingredients—many from your kitchen—to create the perfect mask for you! Plus, the herbs provide gentle exfoliation, so each of these recipes will leave your skin looking fresh and polished. We’ve listed five do-it-yourself mask recipes below that you can try at home. If you have other recipes that have worked for you, please share them with our readers! Best for basic moisturizing nourishment—calming and non-irritating, it leaves skin hydrated and refreshed. Blend in a food processor until creamy. Apply to skin and leave on 10-20 minutes, rinse. Best when skin is feeling dry, irritated, and parched (great for winter skin!). Helps infuse moisture and nutrients into skin, while encouraging gentle revival, leaving skin smooth and soft. If you’re going on a date, this is a good one to use beforehand! Best when you're looking for a brighter lighter appearance or have a general dull complexion. Helps stimulate and brings a rosy glow back to skin. 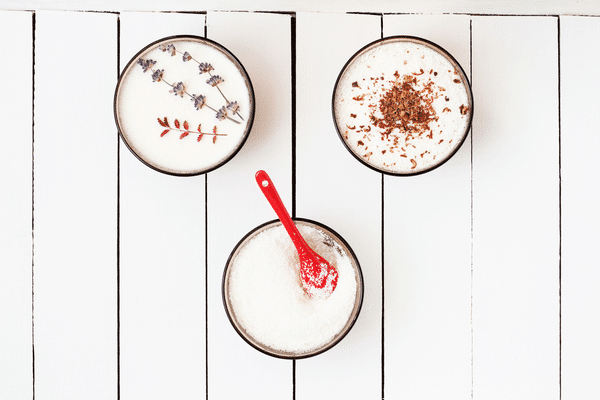 Whisk together until blended. Apply to face and leave on for 10-30 minutes. Rinse. Best for those with oily or combination skin. Helps absorb excess oil and balance natural oils, minimize the appearance of large pores, and helps with an occasional breakout. Blend the fruit in a food processor. Mix wth all other ingredients until they form a smooth paste. Apply and leave on for 15-20 minutes. Rinse. Best for reviving the look of aging skin. Also helps skin better protect itself. Helps reduce the appearance of fine lines and wrinkles, while improving radiance and glow. Mash and mix together until you have a thick paste. (Adjust ingredients as needed.) Leave on skin for 15-20 minutes and rinse. It's easy to take your DIY face mask to the next level with herbs. 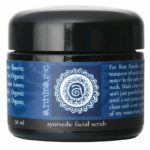 Click here to check out our Ayurvedic Facial Scrub. Have you tried our Ayurvedic Facial Scrub in a mask? Please share any tips you may have. Hi MaryLou! For the Purifying Mud Mask, you mix it with water in your hand to create a paste. Apply this paste either to your whole face or just your oily areas (typically the forehead, nose, and chin). Don’t put water directly into the container as it will spoil. You can also mix it with rose water or apple cider vinegar! Is there a recipe for MIY Ayurvedic face scrub, or is it a product that must be purchased? Once these masks are made up can they be stored in the refrigerator for a length of time? Hi Amy! Because the Ayurvedic Scrub is made with fresh herbs, I wouldn’t store these the refrigerator for more than 3-4 days. I LOVE THE AYURVEDIC SCRUB, I JUST MIX WITH A LITTLE CLEANSER & FEW DROPS OF H2O & SCRUB FACE. LEAVES SKIN SO SOFT!